Seventy-five years ago, on 9-10 November 1938, Nazi persecution of the Jews took an ominous turn. Reacting to the assassination of a German diplomat in Paris by a Jewish man whose family had already suffered terribly under the Nazi regime, a pogrom took place in Germany and Austria during which scores of Jews were murdered, tens of thousands were arrested and taken to concentration camps, and many synagogues were burned and destroyed. 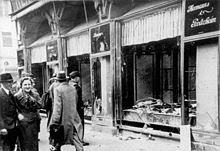 It is known as die Kristallnacht because of the broken glass that littered the roads and footpaths next to Jewish-owned shops and synagogues. No convictions were ever registered for the Kristallnacht atrocities by either the International Military Tribunal or in the subsequent proceedings held by American military tribunals at Nuremberg. The reason is the approach taken by these courts to the scope of crimes against humanity. Pursuant to the Charter of the International Military Tribunal, where crimes against humanity were first codified, a link with the aggressive war was required as an element of the crime. Indeed, there were no convictions by these tribunals for any crimes against humanity committed prior to September 1939. As I noted in an article published a few months ago in the Leiden Journal of International Law, one of the significant features of the Eichmann trial held in Jerusalem in 1961 (for those readers who have not seen it, the current film on the trial, ‘Hannah Arendt’, is highly recommended) was the first conviction for crimes against humanity committed prior to the outbreak of the war. The judgment contains the following passages that are of relevance to Kristallnacht. 57. On 27 October 1938 the Germans for the first time carried out an act of mass expulsion against Jews. Thousands of Jews of Polish nationality living in German cities were arrested simultaneously, transported by rail to the Polish border in the region of Zbaszyn and cruelly expelled and forced to cross the border (Session 14, Vol. I, p. 207; Session 17, Vol. I p. 226). Amongst them was the witness Zyndel Grynszpan, who had been living in Hanover since 1911, with his wife and two of his children. Another of his sons, Hirsch Feivel Grynszpan, shot the Counsellor of the German Embassy in Paris, vom Rath. After this act, the wave of persecution swelled up against the Jews in general. On 9 November 1938 news came that vom Rath had died of his wounds, and immediately the signal was given for pogroms against the Jews on the same night (the eve of 10 November 1938), known as “Crystal Night.” In the cities of Germany organized gangs burst into Jewish shops and apartments on orders from above, committed acts of violence against Jews, destroyed and plundered everything that fell into their hands. One hundred and ninety-one synagogues went up in flames and another seventy-six synagogues were demolished. The day after, throughout the Reich, there began the arrests of thousands of male Jews, who were brought to concentration camps. On 12 November 1938, Goering, who was in charge of the Four Year Plan, issued an order for the payment by the Jews of Germany of a billion marks as “expiation money.” This order was carried out by levying twenty-five per cent of the value of Jewish property (T/634). He also issued a second order on the same day forbidding Jews, inter alia, to maintain retail establishments and to work as independent craftsmen (T/76). During the same period regulations were issued for the “Aryanization” of Jewish businesses and other assets, that is to say, for their forced transfer to non- Jews at unrealistic prices (T/79). Simultaneously with the persecution of the Jews as individuals came the control by the German state over their autonomous institutions. In March 1938, their status as public bodies was withdrawn from the Jewish communities, which thereby lost their authority to levy taxes, and on 4 July 1939 the Jews were organized compulsorily in the “Reich Association of the Jews in Germany” (Reichsvereinigung) which was placed under the control of the Minister of the Interior (T/81). The minister was also authorized to disband existing Jewish organizations or to merge them in the Reich Association. Such a merger of an organization involved a transfer of its assets to the Reich Association. Thus a convenient instrument was created for total control by the Reich Government of the public property of German Jewry.
. “He (the Accused) spoke about the unsatisfactory rate of the disappearance of Jews from Vienna. He said that entirely different ways and measures would have to be used, and that he would see to that.” (Session 17, Vol. I, p. 262.) And so we read in the general report describing the activities of Dr. Loewenherz about a conversation which took place in March 1939, when the Accused said to him, “that the number of applications for emigration had gone down considerably in the last few days, and if the number of applications did not go up within two days, he would propose the adoption of measures which could take on the same form for everyone as in November 1938” (T/154, p. 9; Session 90, Vol. IV, pp.xxxx15, 16; with regard to the authentication of the report, see Mr. Zidon's affidavit, T/37 (233)).
. A similar threat was uttered by the Accused to the representatives of German Jewry after their visit to Vienna, when it displeased him that, while there, they contacted the Jews of Vienna of their own accord. 184. With regard to the period up to the outbreak of war, the acts specified in section (d) of the third count were not yet part of the programme for the Final Solution by way of complete physical extermination. Accordingly, we have to consider separately each of these series of acts - for example, the events of the Crystal Night. If so, there is, in our view, grounds for saying that the mass acts of violence, committed by the National Socialist regime up to the outbreak of the War, as for instance the dispatch of thousands of Jews to concentration camps, were already committed with intent to destroy the Jewish People in part, and therefore they already come within the definition of “crime against the Jewish People,” within the meaning of Section 1(a)(1) of the Nazis and Nazi Collaborators (Punishment) Law; for it was clear from the outset to those who sent the Jews to the concentration camps because of their being Jews, that the prisoners would be placed there in such living conditions as would cause many of them to die - and this was the purpose of those who sent them there. But there is no need for us to decide this question finally, because, in our view, it has not been proved that, until his transfer to Vienna in 1938, the Accused had already taken an active part in the mass persecutions mentioned in section (d) of the third count. We have explained above (in section 62) that up to that date the Accused was engaged in intelligence work and not on executive measures. We have also found that it has not been proved that the Accused participated in the organization of the Crystal Night in Austria (Section 64). Thus, although Eichmann was not convicted for direct involvement in the Kristallnacht, he was convicted of crimes against humanity that were part of the aftermath of that terrible night. Eichmann 'exploited for his own purposes the panic which reigned amongst the Jews because of these events, in order to speed up the process of forced emigration'.